*UPDATE: 4/2013 I drove by Cascade last week right at the time school was getting out. There isn't one, or two, but THREE crossing guards at the intersection presented in the graphic below. One on each corner of Bruin Blvd and one across Casino Road. They are stopping car and foot traffic when necessary and getting the buses out. I don't believe that solutions are always complicated and expensive. But, that's how government entities operate - get a committee of trusted "experts" who stand to make a buck from their solution and then have them use copious amounts of money studying the issue only to come back with a complicated solution that will cost copious amounts of money to fix. Common sense isn't so common anymore. I'm glad the district took our suggestion. Recently, the Everett School District got parents all worked up over the possibility that school start and end times might have to be changed to accommodate bus schedules. Apparently, without much documentation (available to the public, anyway), they determined that traffic at some of the schools was costing an additional $165,000 in bus costs because they had to run extra buses to make up for traffic jams at the schools in order to keep everything on schedule. So, their idea was to meddle with school start/end times to allow more time to get buses around. This resulted in a bit of a public outcry over their plan to start some elementary schools later and let them out later. This would have resulted in elementary walkers getting home in some areas well after the 4:18 sunset in December. Then, it morphed into THREE potential time changes of various configurations across ALL the schools and a confusing survey parents had to wade through. The results were exactly as I predicted - parents would choose the "selfish" option and "no change" would still be the winner. I marveled that parents with kids in elementary school said starting high school earlier but leaving elementary school the same was a good choice. Do they not realize they will have to pay that piper in a few years? But, at the end, the biggest winner was leaving times as they were. However, a side discussion was started by The Herald over whether or not starting high school so early in the first place was a good idea. I think that's something to talk about over time since research shows it's best for students. I went to dinner with a friend last Friday who had attended a meeting about the schedule changes at Forest View Elementary. She was amazed that the district admitted that they THINK it will save them $163,000 (but they didn't really know) and that the problems with traffic were really only at Cascade and Jackson high schools. Her question was, why then were they going to mess up everyone's schedule for problems at two high schools? I am well aware of what happens at Cascade. And, the solution is so easy. In fact, it's already being done at Seattle Hill Elementary near me in the Snohomish district because I get caught in that traffic all the time. Put a crossing guard on Bruin Boulevard - end of story. Yes, I know that crossing guards aren't cool when you're in high school. Let's call it a "Traffic Control Technician" then. But, slap an orange vest on a $16/hour part-time employee and get those buses out of their lot and on to Casino Road. Here's my diagram of the set-up at Cascade. That corner of Bruin and Casino is tricky. The eastern corner sticks out farther than the western one and a cross-walk connects the two at an angle. Of course, when school lets out, that crosswalk is just a stream of kids walking home. 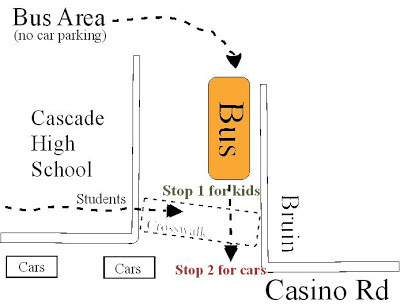 So, the buses come out of their own pick-up area on to Bruin Blvd and have to stop for all those kids. Now, we know that pedestrians have the right-of-way so that stream can be endless and without gaps for quite a while. 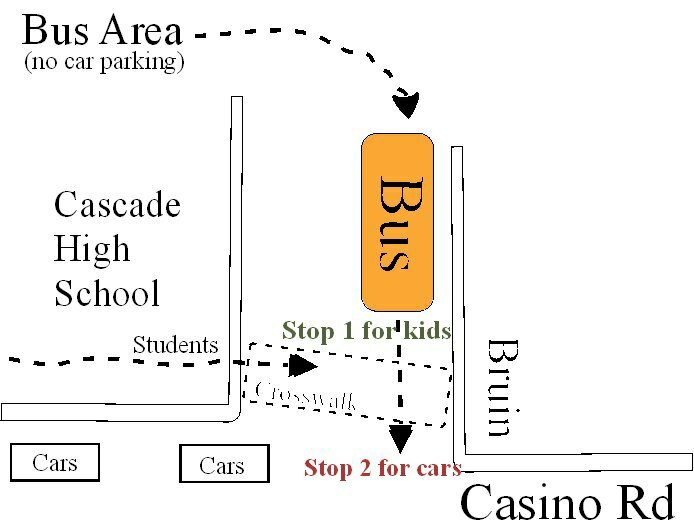 Once there IS a gap, the bus must creep forward and stop AGAIN for cars coming out of the school and heading east on Casino. The buses can't see traffic coming from their left until they make that second stop due to the nature of that corner and a house sitting on it. So, it's a double stop - once for students and once for traffic. Place a Traffic Control Technician on the corner to stop traffic. The one at Seattle Hill stands in the middle of the street in her orange vest and alternately lets traffic in the street flow while letting cars out of the parking lot. That job is, per the district employment site, $16/hour for 1.5 hours a day and 191 days a year (not sure why since school is in session only 180). That's less than $5,000 to fix half of the $165,000 expense of extra buses. You could take it a step further and get the city of Everett involved. That blind corner needs a traffic light and crosswalk sign. It is really pretty dangerous. You really can't see well to your left and if there is a car parked on the street, it's even worse. You must stop almost at the outside edge of the crosswalk to see anything. I believe that stopping in a crosswalk is illegal. But, how else do you do it? So, go to the city and ask for a study of that corner and perhaps a light or three-way stop for safety. That fix doesn't cost the district anything. Like I said, I haven't experienced what the issue is at Jackson, but I suspect another well-placed "Traffic Control Technician" would also take care of it. That would be less than $10,000 in cost to fix the problem the district thinks is costing it $165,000. I believe sometimes the answers are far more simple than they are made out to be. Re-arranging school start and end times for a small issue at two high schools was like using dynamite to get rid of a weed in the yard. But, the issue of workplace rules and district policies may be the real driver here. Sometimes the simple solution is prohibited because the complex answer is more profitable for those involved in the situation. If you haven't already heard, though, there will be no time changes at any schools next year. The issue will be revisited the following year, though. I am glad that is the outcome because when you schedule a child, you schedule a whole family and changing, especially at the elementary level, was going to be problematic for a lot of families. But, it appears to me that we didn't really even have to consider it in the first place. And, if they REALLY need that money to keep those extra buses running, let's look to the amount of money allocated to the School Board in the budget. It's currently $606,000 but it's been closer to $1 million in past years. That is ridiculous. Board members get paid a token amount per meeting (like barely out of the teens). It seems to just be a slush fund of sorts for administration (dinners, legal fees, travel, etc). When you compare us to surrounding and comparable districts, we are spending a lot more per student to support the school board. If you removed $163,000 from that budget, it would put Everett into the middle of the pack and more in line with what other districts allocate to their boards.